This awesome post gives a very thorough list of tips and information you'll need to consider when setting up your first website AND it's also a brilliant resource if you're considering updating your existing website. If you don't share your knowledge with your veterinary clients you can't blame them for turning to Dr Google! Publishing the right information at the right time can be an essential part of your relationship with existing and potential clients and is a great way to add value. 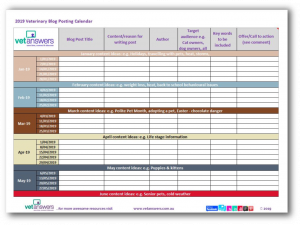 The Calendar allows you to plan out what is to be written, content, author, target audience, keywords and your offer or 'call to action' - all essential blog post components. - Add your website URL and then sit back and wait for Broken Link Check to provide you with a list of links that need fixing - AND it's FREE!